Magnatrol Valve's 316SS solenoid valve fits pipes up to 6 inches wide. All wetted components are made from 316-stainless steel. The rotary-shaft valve isolates fluid from all magnetic solenoid components and easily handles corrosive or viscous fluids. 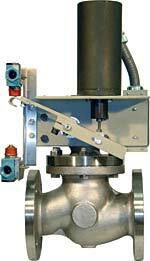 The valve is available in ½- to 6-inch pipe sizes.